I'm going to try and recount that surreal experience before a year passes by and I slowly forget. In my mind, this is how Philippines might have looked like in the 80's. 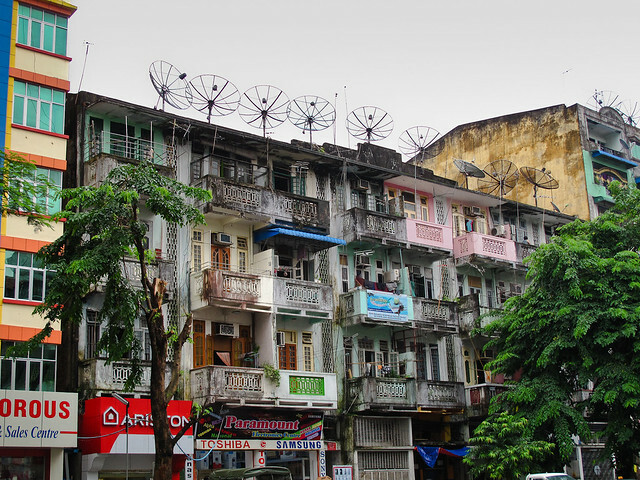 The rest of the world, with its neon billboards and bullet trains, have left Myanmar trapped in the past century. It felt like a trip back in time and I had no problem imagining Ferdinand Marcos as the ruler. 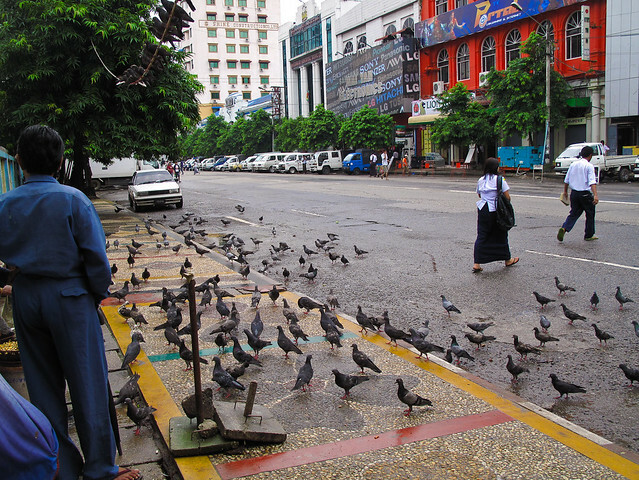 I thought of Yangon as a cleaner version of Recto, with the throng of U-belt students replaced by men in longyi. It is a country with a few skyscrapers in sight and hardly no ATMs. It was a rainy day when we arrived. The streets were clean and litter-free but most buildings were dingy, to which I attribute the Recto-feel. There were magnificent architectures in different stages of ruin. 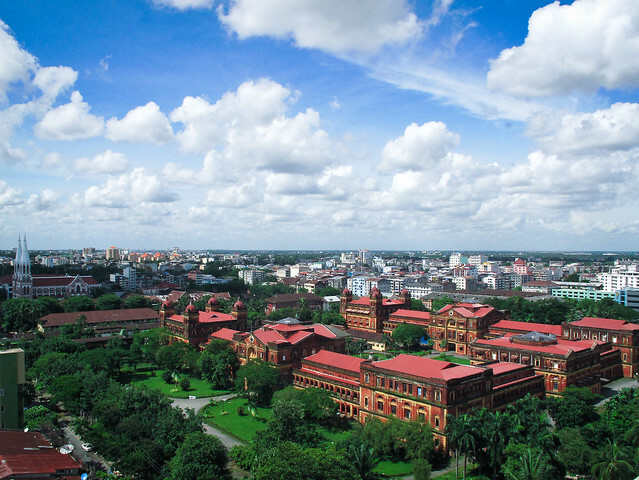 Below is a photo of The Minister's Building which used to be the home of the administrative seat back in the time when Yangon was still the capital of Myanmar. We walked around the block and was disappointed when we found out that the gates were closed. Then came another letdown: military men were washing and drying their clothes out in the vast lawn. Sure that huge structure can house troops but there seems to be other worthwhile things to do with a century-old edifice than let it crumble away. I bought a guava from a street vendor and munched on it on the way back. 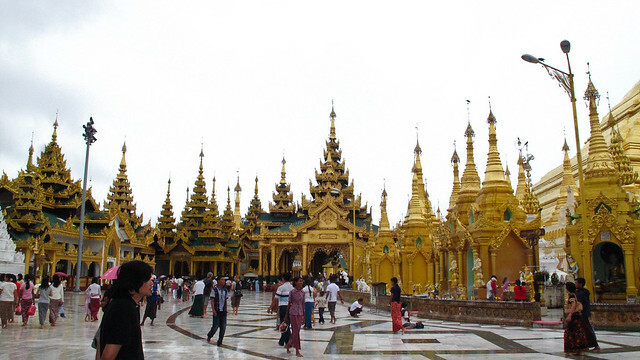 We visited the Sule Pagoda, Shwedagon Pagoda, and Bogyoke Aung San Market. 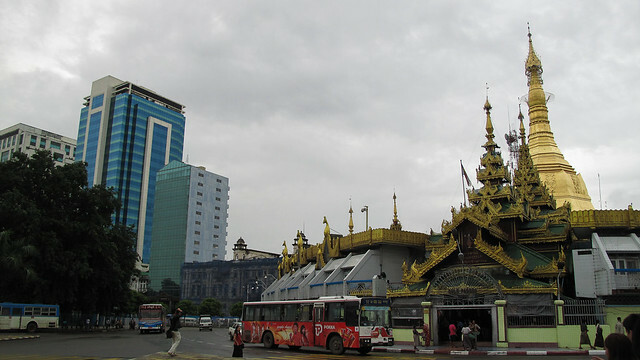 Here is a shot of the Sule Pagoda gleaming against the gray clouds. We went around the pagoda silently, snatching photos here and there as devout Buddhists said their prayers. The next stop for lunch: Bogyoke Aung San Market. I forgot the name of the dish but I remember it tasting like our local misua dish. 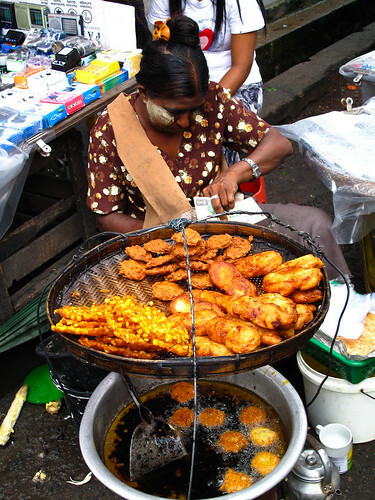 The right photo is a vendor of an okoy-looking food. After a filling lunch, we walked towards Shwedagon along with the monks. Vendors were lined-up on both sides of the street selling everything from Buddha images and candles to necklaces and plastic flowers. The boys decided to get their own longyis and got a free tutorial on how to wear one. The way to Shwedagon is through a long flight of stairs. At the top of the stairs, this wide open complex of pagodas plated in gold greeted us. I have never seen so much gold-plated things. At the tip of the Shwedagon is a 76 carat diamond. I made several attempts to create a panoramic shot but I just couldn't bring myself to steady my hands and come to a full circle. I spent the day noticing things and making little notes in my head. 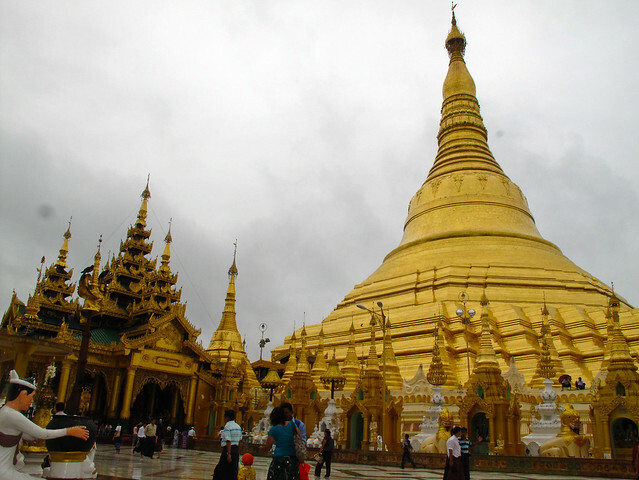 After Shwedagon, I decided that I liked Myanmar. With all the contradicting things that I thought of, what won me over was the way how things subtly gelled together. For a country with an economy that is one of the least developed in the world, who would expect to see huge gold-plated pagodas and a larger-than-life Buddha patched with golden leaves daily? For the itinerary of this trip and all the nitty gritty, please visit Eazy's post. This is Day 1 of a week-long trip to Myanmar. Next stop: Bagan.